How do we define experiences that suspend disbelief and absorb us? People always want the most immersive experience possible, especially when it comes to entertainment. It's the reason why Renaissance Fairs are located away from highways so the only sounds you hear are the steady clop of hooves and the clash of swords. It's the reason why movie theaters turn off the lights so you can only see the screen. According to Wikipedia, an immersive experience (and in turn, immersion) is "the perception of being physically present in a non-physical world." In terms of virtual and augmented reality, this holds doubly true. This article will fully define what elements define an immersive experience and what steps you can take to improve your immersion in your next virtual or augmented experience. Immersion relies on the use of our senses, specifically four of them: sight, sound, touch, and scent. Virtual reality uses sight, sound, and sometimes touch. Sight: The virtual reality headset blocks out the peripheral vision (or uses a wrap-around headset to enhance it) to focus the wearer's attention on what is happening directly in front of them. Augmented reality makes use of headsets or smartphone displays to add virtual elements to the real world. Sound: Virtual reality headsets include sound-dampening headphones that force the wearer to focus on the sounds of the virtual world. Augmented reality provides sounds for whatever is taking place on screen. Touch: Accessories for virtual reality headsets can provide haptic feedback for the wearer. Other examples of the use of touch include vibrations and rumbles when an item is picked up or impact is made with something in the virtual world. Augmented reality rarely uses touch to increase immersion due to the limitations of augmented reality technology. All of these different elements combine to create an immersive experience, but a large part of "true" immersion relies on a suspension of disbelief and a willingness to be transported to a different world. There are a number of different technologies and hardware that enable immersive experiences, but some are better than others. The following are the most popular options. Microsoft HoloLens: The HoloLens was first announced with gaming in mind, but has since expanded into a number of commercial applications. Interior designers can use it to visualize how a room will look once furnished. Architects can use it to envision a city skyline with a new building in place. The HoloLens has a lot of potential, but has a high price tag and limited consumer applications. HTC Vive Pro: The HTC Vive Pro is one of the most immersive headsets on the market. It makes use of two cameras for full room-scale tracking in a space up to 4.5 meters by 4.5 meters. Unlike the Oculus Rift or other hardware like that, you don't move around with a control stick—you actually walk around the room. The original version of the HTC Vive had a much lower resolution that detracted from the immersion, but the HTC Vive Pro increases the resolution to new levels that make it easy to believe you're in the virtual world. Oculus Rift: The Oculus Rift was the original virtual reality headset. 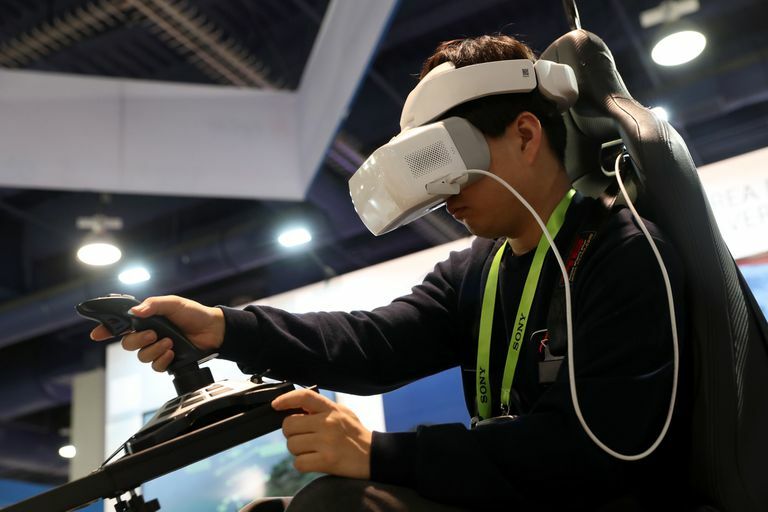 Although more recent iterations include one-to-one motion tracking, the Rift is best used sitting in a chair with a controller or keyboard. The one downside to virtual reality equipment is how expensive it is. However, options like the Samsung Gear VR make the virtual world accessible to anyone with a powerful enough smartphone. Google has also taken steps in that direction with the Magic Leap. And if neither of those options is feasible, there are low-end virtual reality headsets available for as little as $20. Entertainment is poised to turn over a new leaf as consumers demand more immersive experiences. Films, games, and even music have all been designed and structured in a way that benefit from virtual reality. Imagine turning your head in a film, only to see a dragon swooping down on you. It certainly blows the old-school 3D movies out of the water.